Please print this FREE pattern sheet and share with your friends. 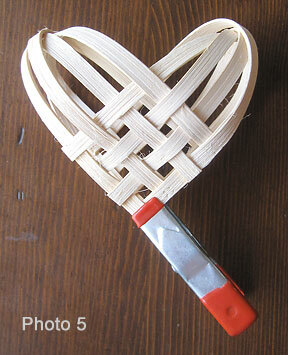 A Woven Heart Pattern Sheet PDF - size 242 KB. 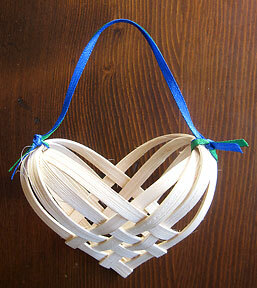 Follow Beth Hester as she makes a woven heart in this video. 1. Cut 8 pieces of 1/4 inch flat reed exactly 6 1/2 inches long. Make cuts at right angles to the long side. 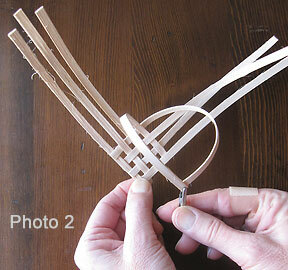 If the reed is curling, assemble every piece with the curl facing away from you. (Be more concerned with the direction of the curl than with the right and wrong side of the reed. 2. Put a small drop of quick-drying glue at the end of one piece of reed, and overlap with the end of a second piece, at a right angle. Be sure to align outside edges. Clamp with a small clip until glue is dry. Spritz with the accelerator ( how-to video using glue and accelerator ). See Photo 1A. 3. Take another piece, placing it under the first piece, and glue no more than ¼ inch from the second piece as shown in Photo 1A. 4. Place the fourth piece under the last piece you added and over the second one, keeping the space consistent, using a small drop of glue on the end each time, and clip. At this point you have made a hole that’s perfectly square at the point of your heart. As you continue adding pieces, be sure to keep your reed parallel and your holes square. 5. Repeat these steps until you have used all eight pieces of reed, four on each side, being careful to weave each one in an over and under pattern. One side is now complete. See Photo 1B. 6. 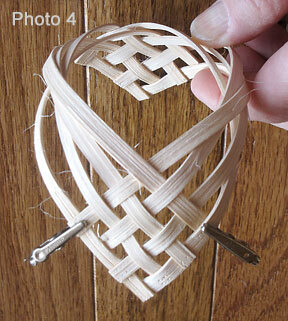 Turn the piece over so the reed is curling toward you and the heart pointing toward you. 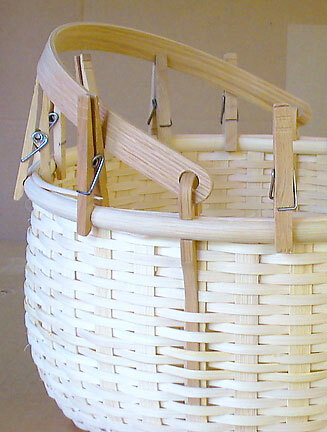 You’ll weave the second side by working in pairs from the center outward. Start with the two pieces opposite the point of the heart. 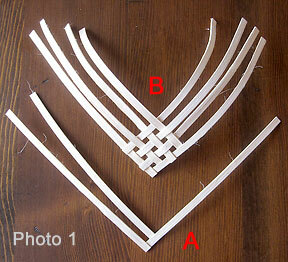 Glue at a right angle, aligning edges, as described in Step 2. You now have two identical sides. See Photo 4. Wet the “shoulders” of the heart and gently bend, bringing the two points together. 8. Place a drop of glue on the inside of one point and glue the points together, clipping until secure. (If this doesn’t hold, a piece of invisible thread will secure this critical juncture.) 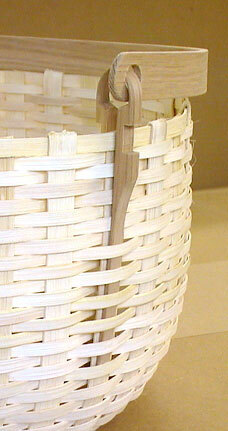 Closely trim any uneven edges with basketry shears if needed. 9. Tie a piece of ribbon onto the “shoulders” of the heart, tying each side as tightly as possible to bring the individual pieces together. 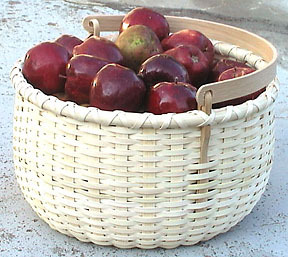 Now your woven heart is complete!